What are the different types or terms that describe pneumonia? What is the contagious period for pneumonia? What are risk factors for pneumonia? What are pneumonia symptoms and signs? How do health care professionals diagnose pneumonia? What types of doctors treat pneumonia? What are complications of pneumonia? Is it possible to prevent pneumonia? Is there a pneumonia vaccine? Are side effects associated with the pneumonia vaccine? How many pneumonia vaccines do you need? Pneumonia is a lung disease characterized by inflammation of the airspaces in the lungs, most commonly due to an infection. Pneumonia may be caused by viral infections, bacterial infections, or fungi; less frequently by other causes. The most common bacterial type that causes pneumonia is Streptococcus pneumoniae. This article discusses both community-acquired pneumonia (CAP), which is acquired outside of the health care setting, and hospital-acquired (or health care-acquired) pneumonia (HAP), which is typically more serious. About 20% of those with CAP require treatment in a hospital. Antibiotics treat pneumonia by controlling the bacterial or fungal infection. The initial choice of antibiotic depends on the organism presumed to be causing the infection as well as local patterns of antibiotic resistance. Pneumonia can be fatal in up to 30% of severe cases that are managed in the intensive care setting. Complications of pneumonia include sepsis, pleural effusion, and empyema. Influenza and respiratory syncytial virus (RSV) are the most common viral causes of pneumonia. Antiviral medications may be used to treat pneumonia caused by some types of viruses. Most kinds of bacterial pneumonia are not highly contagious, but tuberculosis and Mycoplasma pneumonia are exceptions. A chest X-ray is typically done to diagnose pneumonia. 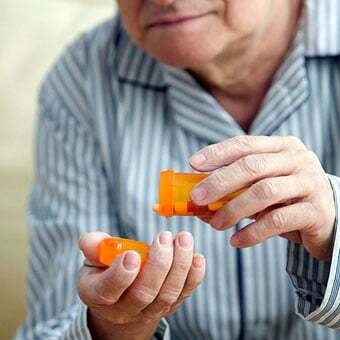 Risk factors for pneumonia include age over 65 or under 2, having certain chronic medical conditions (including a weak immune system, underlying lung disease, cigarette smoking, alcoholism, and neurological problems), or sustaining injuries that interfere with swallowing or coughing. Vaccinations are available against several common organisms that are known to cause pneumonia. Pneumonia often starts with symptoms typical of a cold or upper respiratory infection, like sore throat, nasal congestion, and cough. As the infection develops in the lung, high fever is apparent along with chills and a cough that produces thick sputum. Chest pain can occur if the outer layer (pleura) of the lungs is involved in the inflammatory process. Pneumonia is an inflammation of the airspaces (alveoli; singular alveolus) in the lung most commonly caused by infections. Bacteria, viruses, or fungi (infrequently) can cause the infection. There are also a few noninfectious types of pneumonia that are caused by inhaling or aspirating foreign matter or toxic substances into the lungs. Some cases of pneumonia are life-threatening. Around 50,000 people die each year of pneumonia in the U.S. Although anyone of any age can be affected, pneumonia is more common in elderly people and often occurs when the immune system becomes weakened via a prior infection or another condition. Pneumonia is generally more serious when it affects older adults, infants and young children, those with chronic medical conditions, or those with weakened immune function. Pneumonia can be classified or characterized in different ways. Health care professionals often refer to pneumonia based upon the way that the infection is acquired, such as community-acquired pneumonia or hospital-acquired pneumonia. Community-acquired pneumonia (CAP), as the name implies, is a respiratory infection of the lung that develops outside of the hospital or health care environment. It is more common than hospital-acquired pneumonia. CAP is most common in winter and affects about 4 million people a year in the U.S.
Hospital-acquired pneumonia (HAP) is acquired when an individual is already hospitalized for another condition. HAP is generally more serious because it develops in ill patients already hospitalized or under medical care for another condition. Being on a ventilator for respiratory support increases the risk of acquiring HAP. Health care-associated pneumonia is acquired from other health care settings, like kidney dialysis centers, outpatient clinics, or nursing homes. Other classification systems for pneumonia describe the way the inflammatory cells infiltrate the lung tissue or the appearance of the affected tissue (see the following examples). Bronchopneumonia causes scattered, patchy infiltrates of inflammation in the air sacs throughout the lungs. It is more diffuse than lobar pneumonia. Lobar pneumonia causes an inflammation of one lobe of a lung and typically involves all the airspaces in a single lobe. Lipoid pneumonia is characterized by the accumulation of fats within the airspaces. It can be caused by aspiration of oils or associated with airway obstruction. Sometimes, types of pneumonia are referred to by the type of organism that causes the inflammation, such as bacterial pneumonia, viral pneumonia, or fungal pneumonia. The specific organism name may also be used to describe the types of pneumonia, such as pneumococcal (Streptococcus pneumoniae) pneumonia or Legionella pneumonia. Aspiration pneumonia develops as a result of inhaling food or drink, saliva, or vomit into the lungs. This occurs when the swallowing reflex is impaired, such as with brain injury or in an intoxicated person. Several types of bacteria, including Legionella pneumophila, Mycoplasma pneumoniae, and Chlamydophila pneumoniae, cause atypical pneumonia. It is sometimes called "walking pneumonia" and is referred to as atypical because its symptoms differ from those of other types of bacterial pneumonia. 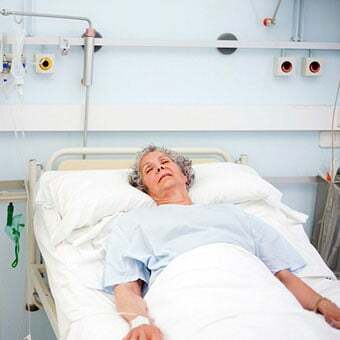 Pneumonia that arises from being on a ventilator for respiratory support in the intensive care setting is known as ventilator-associated pneumonia. Most types of bacterial pneumonia are not highly contagious. Even though it is possible to spread bacteria from one person to another, pneumonia typically occurs in people with risk factors or weakened immune defenses when bacteria that are normally present in the nose or throat invade the lung tissue. 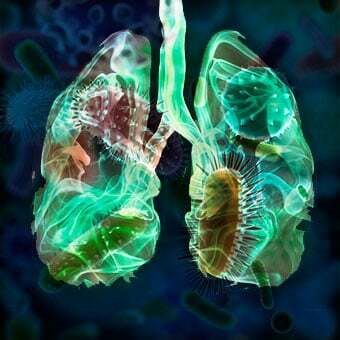 Any kind of bacterial or viral pneumonia has the potential to be contagious, but Mycoplasma pneumoniae and Mycobacterium tuberculosis (the cause of tuberculosis) are two types of bacterial pneumonia that are highly contagious. Breathing in infected droplets that come from patients who are coughing or sneezing can spread the disease to others. It is impossible to say with certainty exactly how long an adult or child with pneumonia is contagious, since this varies according to the type of germ or organism that caused the pneumonia. This contagious period can range from one to two days to weeks. In general, while an infected person is coughing or sneezing, there is the potential to release contaminated droplets into the air. Many bacterial pneumonias are much less contagious after antibiotics have been taken for about 24-48 hours. However, this time period may vary for some organisms. For example, with tuberculosis, it can take two weeks or more of antibiotics before the person is no longer contagious. With viral pneumonias, the patient becomes less contagious after the symptoms have improved, especially fever. Some people with viral pneumonia may not be contagious after one to two days with no fever, but others may still shed some infectious virus particles for a much longer time. Streptococcus pneumoniae, a type of bacteria, is the most common cause of pneumonia. Legionella pneumophila is the bacterial type that causes the pneumonia known as Legionnaires' disease. Other bacteria types that can cause pneumonia include the bacteria that cause so-called "atypical" pneumonia, Legionella pneumophila, Mycoplasma pneumoniae, and Chlamydophila pneumonia. Haemophilus influenzae is a type of bacteria that can cause pneumonia. It most commonly causes disease in babies and children younger than 5 years of age. Adults 65 years or older, American Indians, and Alaska Natives are also at increased risk for developing H. influenzae disease. The most common cause of viral pneumonia in adults is the influenza virus. A number of different respiratory viruses cause pneumonia in children, such as respiratory syncytial virus (RSV). While viral pneumonia tends to be less severe than bacterial pneumonia, there is a risk of developing secondary bacterial pneumonia when viral pneumonia is present. 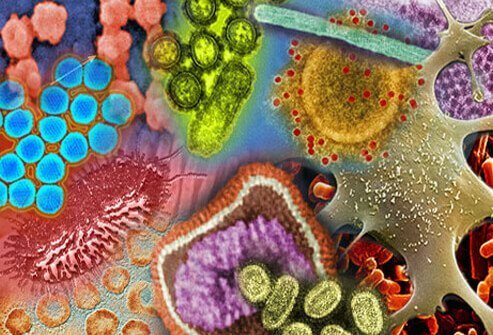 Influenza viruses and respiratory syncytial viruses (RSV), however, may cause serious problems in some patients. Other virus types that can cause pneumonia include measles and varicella (chickenpox) viruses. 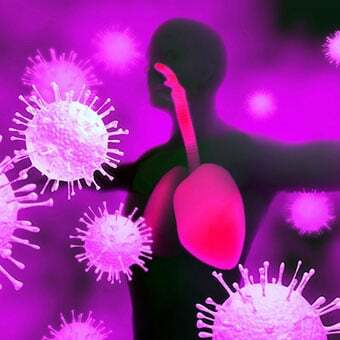 Rarely, certain viruses may cause lethal pneumonias such as SARS (severe acute respiratory syndrome) or MERS (Middle East respiratory syndrome); both diseases are caused by different coronaviruses. Fungi that cause pneumonia include Cryptococcus, Histoplasma, and Coccidioides. In most individuals, these organisms don't cause illness, but they can cause pneumonia in some people. Fungal infections are most common in those with weakened immune systems due to HIV/AIDS or those taking medications that suppress immune function. Another infection that is considered a fungal type of pneumonia is Pneumocystis jirovecii, formerly known as Pneumocystis carinii. This organism became known as a frequent cause of pneumonia in patients with HIV/AIDS. The emphasis of this article is the more common causes of infectious pneumonias, but there are others that may be caused by noninfectious lung irritants like inhalation of chemicals, foods, gasses, liquids, and/or dust. 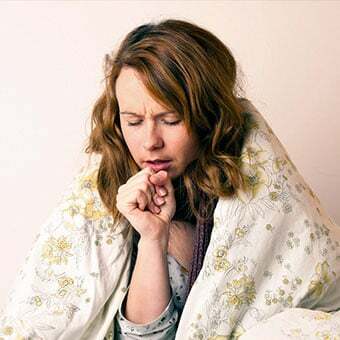 The incubation period for pneumonia depends on the type of organism causing the disease, as well as characteristics of the patient, such as his or her age and overall health status. Most cases of pneumonia begin with symptoms similar to those of a cold or the flu that last longer than the flu (about seven to 10 days) and become more severe. The symptoms of pneumonia can occur from a few days to a week following the flu-like symptoms. Nausea, vomiting, and diarrhea are other possible symptoms that can accompany the respiratory symptoms. Infants and newborns may not show specific symptoms of pneumonia. Instead, the baby or child may appear restless or lethargic. A baby or child with pneumonia may also have a fever or cough or vomit. Older adults or those who have weak immune systems may also have fewer symptoms and a lower temperature. A change in mental status, such as confusion, can develop in older adults with pneumonia. The duration of symptoms varies according to the type of pneumonia and the underlying health status of the individual. In previously healthy people, pneumonia can be a mild illness that resolves within two to three weeks. In older adults and in those with chronic diseases or other health problems, recovery may take six to eight weeks or longer. A chest X-ray is able to illustrate whether or not pneumonia is present, but it does not provide information about the organism responsible for the infection. In some cases, a chest CT scan may be performed. This will reveal more detail than the chest X-ray. Pulse oximetry measures the amount of oxygen in the bloodstream. The test involves a painless sensor attached to the finger or ear. Blood levels of oxygen may be reduced in pneumonia. Microbiology tests to identify the causative organism. Tests may be performed on blood or sputum. Rapid urine tests are available to identify Streptococcus pneumoniae and Legionella pneumophila. Cultures of blood or sputum not only identify the responsible organism but can also be examined to determine which antibiotics are effective against a particular bacterial strain. Bronchoscopy is a procedure in which a thin, lighted tube is inserted into the trachea and major airways. This allows the doctor to visualize the inside of the airways and take tissue samples if needed. Bronchoscopy may be performed in patients with severe pneumonia or if pneumonia worsens despite antibiotic treatment. About 80% of cases of CAP can be managed at home with the patient taking oral antibiotics. There are numerous treatment regimens available. Initial treatment (before the causative organism has been identified) is called empiric treatment and is based upon the organisms most likely to be responsible for the illness. Once the exact organism has been identified in the laboratory and susceptibility testing performed to determine which antibiotics are effective, the treatment regimen can be further individualized. Over-the-counter pain and fever-reducing medications may be recommended for some people in addition to antibiotics or antiviral drugs for symptom relief. Do not take cough or cold medications when suffering from pneumonia without a doctor's approval. In around 20% of cases, CAP must be managed in the hospital, typically with intravenous antibiotics initially. HAP care is managed in the hospital, typically with intravenous antibiotics. Antibiotics are not effective against viral pneumonia. Depending upon the type of virus that causes pneumonia, antiviral medications can provide benefit when started early in the course of the disease. For example, the medications oseltamivir (Tamiflu) and zanamivir (Relenza) are used to treat influenza virus infections. Antifungal agents are used to treat most fungal pneumonias. In some cases, primary care physicians, including pediatricians, internists, and family medicine specialists, may manage the care for patients with pneumonia. In more severe cases, other types of specialists may be involved in treating the patient with pneumonia. These include infectious-disease specialists, pulmonologists, critical care specialists, and hospitalists. There are a number of potential complications of pneumonia. The infection that causes pneumonia can spread to the bloodstream, causing sepsis. Sepsis is a serious condition that can result in lowering of blood pressure and failure of oxygen to reach the tissues of the body, resulting in the need for intensive care management. Another complication is the accumulation of fluid in the space between the lung tissue and the chest wall lining, known as a pleural effusion. The organisms responsible for the pneumonia may infect the fluid in a pleural effusion, known as an empyema. 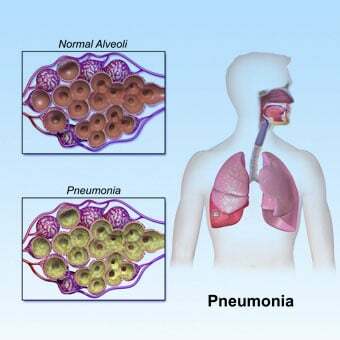 Pneumonia can also result in the formation of an abscess (collection of pus) within the lungs or airways. Most people with pneumonia improve after three to five days of antibiotic treatment, but a mild cough and fatigue can last longer, up to a month. Patients who required treatment in a hospital may take longer to see improvement. Pneumonia can also be fatal. 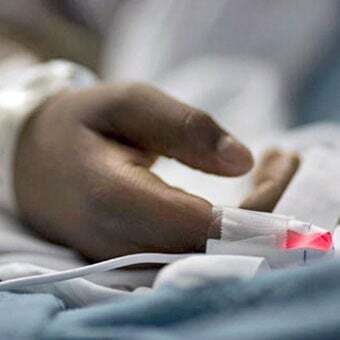 The mortality (death) rate is up to 30% for patients with severe pneumonia who require treatment in an intensive care unit. Overall, around 5%-10% of patients who are treated in a hospital setting die from the disease. Pneumonia is more likely to be fatal in the elderly or those with chronic medical conditions or a weakened immune system. It is not possible to prevent all types of pneumonia, but one can take steps to reduce the chance of contracting the condition by quitting smoking, practicing good hand-washing, and avoiding contact with people who have colds, the flu, or other infections. A vaccine is available against the most common bacterial cause of pneumonia, Streptococcus pneumoniae (also known as Pneumococcus). 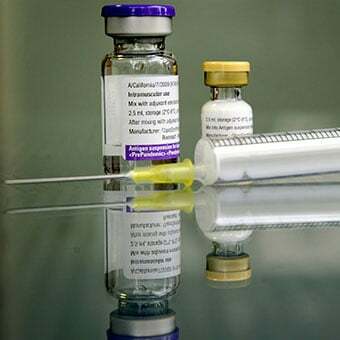 There are two types of vaccine: PPSV23 (Pneumovax), a pneumococcal polysaccharide vaccine against 23 types of the bacteria, and PCV13 (Prevnar 13), a pneumococcal conjugate vaccine that protects against 13 types of the bacteria. These vaccines may not always prevent pneumococcal pneumonia, but they may prevent serious complications of pneumonia if it does occur. Avoidance of areas where fungal pathogens are endemic is recommended to prevent fungal pneumonias. There is no antifungal vaccine available; however, for some high-risk patients, some doctors have recommended prophylactic antifungal drugs. Side effects of PCV13 in children include drowsiness, temporary loss of appetite, or redness, swelling, or tenderness where the shot was given. Mild fever and irritability are other common side effects. Adults receiving pneumococcal vaccines have reported pain, redness, rash, and swelling where the shot was given; also mild fever, fatigue, headache, chills, or muscle pain. Any type of vaccine has the potential to cause an allergic reaction, which can be severe, but this side effect is rare. This would happen within minutes to a few hours after receiving the vaccine. PCV13 or Prevnar 13, is currently recommended for all children younger than 2 years of age, all adults 65 years of age or older, and people 2-64 years of age with certain medical conditions. PPSV23 is currently recommended for all adults 65 years of age or older and for people who are 2 years of age or older and at high risk for pneumococcal disease (for example, those with sickle cell disease, HIV infection, or other immunocompromising conditions). PPSV23 is also recommended for use in adults 19-64 years of age who smoke cigarettes. There is no evidence about the safety of PCV13 or PPSV23 vaccine use in pregnancy. Women who need the vaccine should be vaccinated before a pregnancy, if possible. Some people may be recommended to receive both the PCV13 and PPSV23 vaccines. The U.S. Centers for Disease Control and Prevention (CDC) recommends two pneumococcal vaccines for all adults 65 years or older. The PCV13 and PPSV23 should not be given at the same time. When both vaccines are recommended, a dose of the PCV13 should be given first, followed by a dose of PPSV23 at another visit to a health care provider. Seasonal influenza vaccines are available yearly and are recommended to decrease the chance of contracting influenza. Vaccines against the measles virus and varicella virus, two viruses that can also cause pneumonia, are also available. The common side effects of these vaccines are similar to those listed below for the pneumonia vaccine. American Lung Association. "Pneumonia Fact Sheet." <http://www.lung.org/lung-disease/influenza/in-depth-resources/pneumonia-fact-sheet.html>. United States. Centers for Disease Control and Prevention. "Pneumonia." Aug. 29, 2017. <http://www.cdc.gov/pneumonia/index.html>. The common cold is arguably the most common human illness. Learn how long the common cold lasts and treatment for the common cold. What were your pneumonia symptoms? What treatment was effective for your pneumonia? Did you experience any side effects from the pneumonia vaccine?